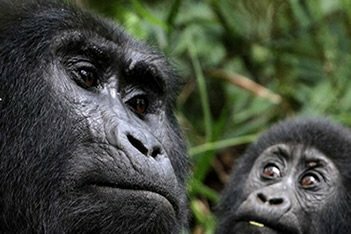 The Akagera National Park (French: Parc National de l.Akagera) covers 1,200km in eastern Rwanda, against the Tanzanian border. It was founded in 1934 to protect animals and vegetation in three eco-regions: Savannah, mountain and swamp. The park is named for the Kagera River which flows along its eastern boundary feeding into several lakes the largest of which is Lake Ihema. The complex system of lakes and linking papyrus swamps makes up over 1/3 of the park and is the largest protected wetland in central Africa. Much of the Savannah area of the park was settled in the late 1990s by former refugees returning after the end of the Rwandan Civil War. Due to land shortages, in 1997 the western boundary was re-gazetted and much of the land allocated as farms to returning refugees. Akagera National Park was reduced in size from over 2,500km² to its current size. Although much of the best Savannah grazing land is now outside Akagera National park boundaries, what remains of Akagera is some of the most diverse and scenic landscape in Africa. Over the next 5 years a US$10 million expenditure is planned for Akagera including the construction of a 120km western boundary fence and the reintroduction of lion and black rhino. Akagera is,above all, big game country! 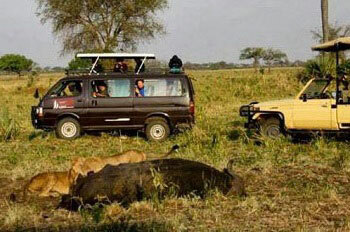 Herds of elephant and buffalo emerge from the woodland to drink at the lakes, while lucky visitors might stumble across a leopard, a spotted hyena or even a stray lion. Giraffe and zebra haunt the Savannah, and more than a dozen types of antelope inhabit the park, most commonly the handsome chestnut-coated impala, but also the diminutive oribi and secretive bush buck, as well as the ungainly tsessebe and the world’s largest antelope, the statuesque Cape eland. Camping alongside the picturesque lakes of Akagera is a truly mystical introduction to the wonders of the African bush. Pods of 50 hippopotamus grunt and splutter throughout the day, while out sized crocodiles soak up the sun with their vast jaws menacingly agape. Magically, the air is torn apart by the unforgettable high duetting of a pair of fish eagles, asserting their status as the avian monarchs of Africa’s waterways. Lining the lakes are some of the continent’s densest concentrations of water birds, while the connecting marshes are the haunt of the endangered and exquisite papyrus gynolek, and the bizarre shoebill stork – the latter perhaps the most eagerly sought of all African birds. There are several faunas, floras and birds which include elephants, buffalos, lions, Masai giraffe, gazelles, impala, baboons, oribi, Butchel’s zebra, topi, bush baby, leopard and bushbuck. Aquatic include crocodiles and hippos. Akagera National park features a large concentration of bird life with over 525 species identified. Unique species such as Shoe billed stocks and papyrus gynolek can be encountered. Endemics include the jacanas, ibis, sand pipers and herons. These include: Camping, Picnics, Nature walks, Bird watching and Boat rides, game drives. The park can be accessed through two gates the Kabarando and Kiyonza. Or it can be accessed by private/domestic charter flights. The park has limited accommodation facilities like the Akagera Game Lodge, Campsites.